Father Kevin McKenzie blogs on life as a priest. The other seminarians have started a countdown to our diaconate ordination. They have posters all over the seminary with our photos and a number count – which is at 22 today. It’s getting close! As well, we received our new albs today. The alb is the white garment the priest wears underneath his priestly vestments. I tried mine on and it fits like a charm. A friend sent me a beautiful photo of Pope Francis at the audience the other day. 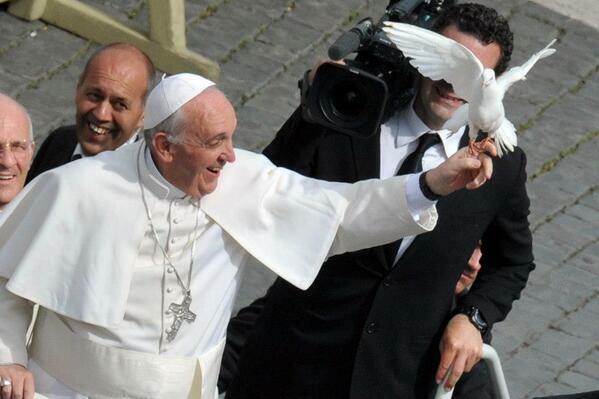 A dove landed on his hand – great sign! My eschatology exam this morning went great. That’s three down, three to go! Join Father Kevin on Pilgrimage! I was ordained a priest on December 14th, 2013. Now I live in Cincinnati, Ohio, where I am chaplain at a Catholic School and spend my time doing youth ministry. It’s great being a priest!!! swapping hats with the Pope! Happy Feast of Saint Joseph!